As your parents get older and their abilities begin to diminish, the roles start to flip, and you may find it’s time to seek out private home nursing care. Rather than relying on your parents to take care of themselves and other family members, the responsibilities often reverse. There was a time when this was more of a natural evolutionary process. The married children lived with the parents. When they needed extra care, extended family or younger generations provided the services. But now, with most grown children working full-time jobs, many must rely on professional nursing services to take care of aging parents and loved ones. Leaving your parents in the hands of strangers can be a scary thought. But the last thing you want to do is to disrupt their lives by sending them outside of the house to live. So by far, the least intrusive way of giving them the support and comfort they need is by letting them stay in their own home. With professional home nursing care on board, you can go to your job knowing your parents are in good hands. Moving parents or loved ones to a nursing home is a traumatic experience. It means the parents are not only failing physically or mentally, but they also have to leave their familiar and comfortable surroundings. They probably spent a lifetime building memories in their home, and to leave that for a harsh and stark institutional lifestyle can be depressing. Nursing homes can be appropriate for senior citizens who are very ill or need round-the-clock supervision, but home health care has significant advantages for those who can stay at home with nursing management where needed. Of course, if you ask your parents, you’ll find there are many more reasons they would like to stay in their own home. If a parent moves to a nursing home, one of the first things to go is the neighborhood. That puts an end to neighbors popping in for a visit unannounced, sitting in the sun (or shade) on the patio or front porch and watching people go by and the regular daily routine of life. At home, old friends can come by for a quick visit, neighbors can bring in hot meals, and family members are always welcome, without the restriction of visiting hours. Professional nurses are well-trained to deal not only with medical emergencies but also with monitoring medical conditions and reporting back to the primary-care physicians. They can relate directly to the doctor and give hands-on treatment as required. As an onsite go-between, they can carry out the doctor’s orders in a timely fashion. Obviously, this is much less stressful than getting in a car and traveling to doctor’s appointments. Private nurses can lessen the number of medical appointments needed and can keep a log of vital statistics. In many instances, this can keep the parent safer by reducing the chances of falling when going out and avoiding exposure to illnesses in a doctor’s waiting room. Additionally, trained nurses have the knowledge and experience in reading clinical symptoms and noting warning signs to determine if your parent needs to see a doctor. If your parent had to undergo surgery or spend time in the hospital for any reason, a private home nurse could handle follow-up care. Depending on the nature of the illness, post-op care could include visits to rehab. Instead of going out for rehab sessions and risking a fall, the home nurse can arrange for rehabilitation in the home. A private nurse can track progress and determine when a parent might need extra help. The nurse can also take care of catheters, IVs, sutures, ointments and dressings, alleviating the need to go into the doctor’s office for this. If a prescription is in order, the private home nurse can get the order from the doctor and call it into the pharmacy. Besides staying comfortable in their own environment, the elderly can stay active longer, which results in better health. Rather than being in a hospital bed in an institution, the parent is more likely to get up and walk around, touch things, see things and even offer supervision at home. In most cases, this encourages healing and a better state of mind. Grab bars, elevated toilet seats and “walk in” showers can enhance private homes, making it simpler to take care of the senior citizen who has difficulty moving around. In addition, the parent is more likely to eat familiar food at home, which can help increase nutritional intake. Elderly parents thrive on the attention and one-on-one care they receive from private home nursing care. The elderly aren’t the only ones who feel uncomfortable in a nursing home setting. The same goes for their families, friends and loved ones, who prefer visiting the elderly family members in their own homes. When grandchildren can come and sit on the bed or in the chair next to their grandparent, it is a pleasant experience. This is very unlike seeing a loved one in a hospital bed in an institutional home, where it can be frightening for a child. 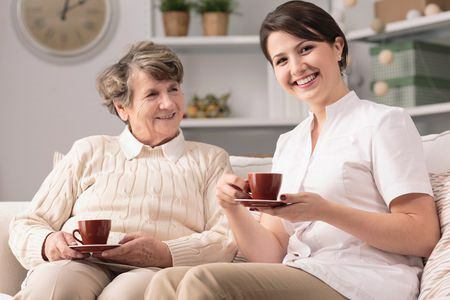 If you’re contemplating private home nursing care for your loved one, call 602.375.8880 to connect with our team of caring medical professionals at Celestial Care. Previous Post How Do You Choose An In-Home Nursing Care Provider? Next Post Why Do Families Choose Home Health Care for Their Loved Ones?